The King of Demons and the Devil's right hand man, Asmodeus is a dark angel born of evil and created for destruction. When his mater orders him to venture into the mortal world and retrieve a female for him, he seizes the chance to leave Hell for the first time, uncaring of what the Devil has planned for her ... until he sets eyes on the most beautiful woman he has ever seen - a female who awakens new feelings within his black heart, unleashing passion so intense that it controls him and desire he cannot resist. Liora is a witch with a bad reputation and an obsession with fighting demons. 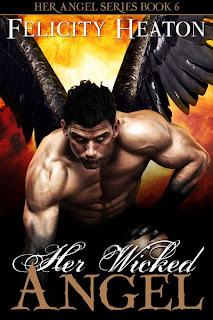 A mission gone wrong sees her sent to Paris to cool off, but when a dark and deadly warrior with a gaze of golden fire lands in her life, she ends up burning hotter than Hell for the wicked angel. Nothing will stand between her and the immense, forbidding male. Not her cousin. Not Asmodeus's sworn enemy and twin, Apollyon. And certainly not the Devil.